Another popular route is the Ruta de Aventura which links the ghost towns and abandoned mines with some excellent areas for hiking, mountain biking and ATV and other extreme sports such as mountaineering, free falling and paragliding. 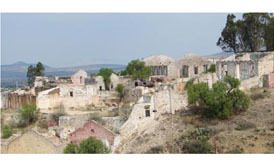 One of the abandoned towns is Mineral de Pozos in the northeast of Guanajuato. The township still has its deserted cobblestone streets with names such as lightning or Relampago in Spanish, stars or Estrellas in Spanish and Flowers, Flores in Spanish which offer an eerily quiet remembrance of a place once fully populated but now deserted. The abandoned homes and numerous structural ruins add to the excitement. 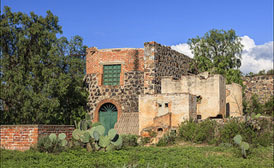 A once popular town during the late 19th and early 20th centuries, when it was named Ciudad Porfirio Díaz before the mines dried up and the population moved out. The town in 1982 was classified as a Historic Monument Zone. 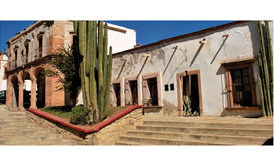 Despite nobody living there, tourists maintain a vibrant and thriving business alive mainly around the main square called the Pozos cantina, which exhibits period photographs and other of the town’s memorabilia on its ramparts. 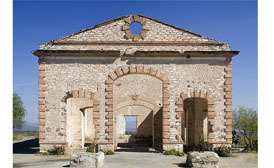 The Santa Brigida mine can be found outside the town, it provided all the financial income to the town while it existed. You´ll know you’re close to it when you see three large ovens accompanying tall pyramid roofs. Constructed by the Jesuits to work ore from the mine, they follow similar style to other Jesuit structures found in Mexico.